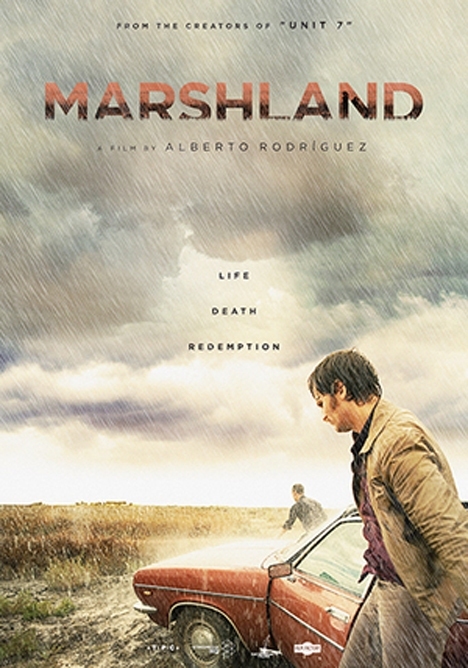 “Marshland” gets advertised as “The Spanish ‘True Detective'”, and once you’ve seen the movie (and the HBO-series), it’s clear why: Because it’s true! Seriously, though, the similarities are indisputable (even though both the show and the movie were made at about the same time, so I don’t suggest any sort of influence in either direction. It’s just an odd coincidence), and truth be told, I might have been slightly more impressed with “Marshland” if I wouldn’t have seen the painfully similar “True Detective” a couple of months prior. That said, even though it feels a little well-trodden, especially with “True Detective” in mind, it’s still a really good thriller. One of the things that stood out for me were the beautiful aerial shots, which are actually based on photographs of the marshlands. Alberto Rodríguez’ direction is also really great. He offers a couple of beautiful shots and images, and also gives the movie a nice, eerie atmosphere. He also knows how to use – and shoot – the titular marshland to great effect. And while the tension only builds up sparingly, when it does, it’s highly effective – with the showdown a particular standout. The acting was superb, especially Javier Gutiérrez, whose character is still haunted by his troubled past; but Raúl Arévalo as his young, hungry-for-success partner was equally great. I also loved their respective roles, and how they have to learn to work together in order to solve the case. Lastly, the idea to not just simply set this in spain, but to furthermore go into the past, shortly after the Franco-era, adds another interesting layer which really sets it apart from similar movies. Alas, the plot itself is nothing special. Also, as a fan of crime novels and movies, I managed to predict the killer long before the protagonists did, and even apart from that, I found “Marshland” to be a little predictable here and there. Furthermore, there are a couple of clichés, like the uncooperative boss, that I could have done without. My biggest complaint, though, were the seemingly supernatural scenes, and even though they later gave a rational explanation for her testimony, there’s still the question of how she supposedly knew about Juan’s sickness. I get that this scene is mostly there for us, the viewer, to understand that something’s physically wrong with him – but since we ultimately learn about that anyway (and it’s already inferred even before they visit her) I really wish they would have gotten rid of that. Other than that, “Marshland” is a nifty little thriller, which I highly recommend to everyone who was as smitten by “True Detective”‘s first season as I was. Read my buddy Maynard’s review here! This entry was posted in /slash, cinema 2015, movie reviews and tagged /slash, /slash 2015, /slash einhalb, Alberto Rodríguez, Javier Gutiérrez, Marshland, Raúl Arévalo, Rafael Cobos, Spain, thriller. Bookmark the permalink. Yessir, I’ll get right on it, sir. She didnt recognise his sickness, she just recognised him and his past. Hmm… that’s not how I remember it. Would have to watch those two scenes again though to be sure. Anyway, the way I wrote it is the way I saw/understood it. Which, obviously, doesn’t always have to be right ;-). So thanks for pointing it out!